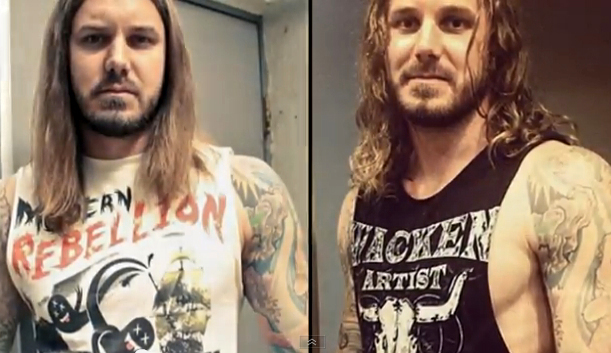 The lead singer of the Christian heavy metal band As I Lay Dying pleaded guilty Tuesday to a felony murder solicitation charge for paying an undercover agent to kill his estranged wife. The singer — Tim Lambesis, 33 — faces a sentence ranging from probation to nine years in prison when he returns to the Vista courthouse May 2. After their meeting, Lambesis told the undercover agent, “Just to clarify, I do want her dead,” the undercover agent testified last September. The trainer subsequently contacted law enforcement and the meeting with “Red” was arranged. Lambesis was arrested May 7. His wife and children went into hiding last year after she learned of the plot to have her killed. Defense attorney Thomas Warwick said earlier that Lambesis had gotten into bodybuilding and eating healthy, and at some point began taking steroids, which affected his thought process.